Well, so much for participating in the Sunday Salon. I had all the best of intentions but I woke up a bit late and then we spent some time organizing our apartment. Finally when we couldn’t stand to be indoors any longer we decided to go out and see some of our new surroundings. We saw some beautiful scenery and as luck would have it, we even discovered a two-story Barnes & Noble along the way. We only stopped in for a quick peek but I did pick up one of their newsletters to see what book groups they host and that sort of thing. I also noted that this store had quite a large Mystery section. Yay. I saw the latest Victoria Thompson book, Murder on Bank Street, which I must get my hands on soon. I really enjoy her Gaslight series. Hmm, I think this calls for a visit to the public library. I can’t wait to get my new library card. Here’s a pic of Austin on a sunny Sunday afternoon. Looks like a beautiful day! And, a two-story B&N, I can’t believe it! I’m so jealous of your new hometown! 🙂 And new library cards are quite exciting! A two-story B&N! Sounds like heaven! I am glad you are getting settled in. 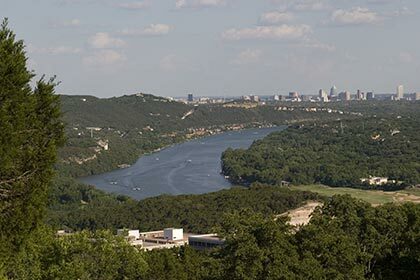 Austin looks like a nice place to live. A whole new library to explore, how wonderful. A friend of mine who is a librarian never goes on holiday anywhere without exploring the local libraries along the way. Fortunately, she has a very tolerant husband. Who is Victoria Thompson? I haven’t come across her. That’s a beautiful picture girl, I can’t wait till I get to come visit you. You’ll have to let me know what book groups they have there. I’ve started reading The Watchman by Robert Crais and it’s really good so far. That’s for our July book group. Did you say you’ve read this? Uggg, I’m so jealous! If I ever get back to Texas I might just have to settle in Austin. Nice picture! It sounds great to be exploring your new city and finding great new things — enjoy! Literary Feline – We have a 2 story B&N in Dallas too but that was too far from my house. This one isn’t too close either but the drive is beautiful so I wouldn’t mind going out there every once in a while! Ann Darnton – Oh that is so cool. I have done that a few times too but not in my recent trips. Oh and Victoria Thompson writes a mystery series set in late 1800s NY. Her main character is a midwife. They are really enjoyable mysteries. Shadan – I can’t wait for you to come visit either! I keep running across places that I think I’ve got to take you to 🙂 Oh no, I haven’t read the Crais book. I’m glad so far it’s good. I can’t believe the awful luck we’ve had with our group this year! Andi – Yep, Austin is the place girl! Austin looks lovely 🙂 I’m glad to hear you’re getting settled in nicely. yay for two floors B&Ns! Glad to see you guys are settling in. I hope you are having fun exploring your new surroundings and I look forward to our visit – hopefully in September! I didn’t get around to participating in the Sunday Salon this week either. We were out most of the day and I was just too tired when we got home. Glad to hear that you’re getting settled in and having fun exploring your new surroundings. Hope you are having fun to finding new books stores. Good luck with your book group hunt. What a lovely photo–it’s so green and lush! How great to have a two floor B&N! I hope you have a nice library, too! Austin is beautiful! A couple of friends have decided to stay after they finished college. I have yet to pay a visit but now I’m very eager. 🙂 We’ve got a B&N emporium here as well, although I prefer Borders. And as always, I try to support the local indies before heading to the chain. that pic is so cool…the water even looks clean from that distance!!! Beautiful! Nymeth – Austin is quite pretty. Lots of scenery and a laid-back atmosphere. I like that! Christine – I can’t wait to see you in Sept. I’m already counting down girl. We are going to have a blast! Isabel – I think you would love it here… hint,hint 🙂 Oh and yes, thank you for the well wishes on the book group hunt. I may try one this week! Danielle – It is isn’t it? I don’t think I realized how dry and brown Dallas is until I saw this picture. I mean, I’ve lived here before but I guess I forgot! Matt – I wanted to stay here after I graduated too but the job market then was awful. It’s nice to be back but in some ways it seems so different. I guess it’s exploded with all the people that live here now! And, if you ever come to Austin I’ll meet you at BookPeople – awesome indie bookstore! What a beautiful pic, Iliana! Wow, a two-story B&N! I’m so jealous, lol.